There are books that I enjoy reading. There are books that I love. And then there are books that fill me with such missionary zeal, I feel a need to press them into the hands of everyone I know! I just discovered a new-to-me book that makes me feel that way, E.K. 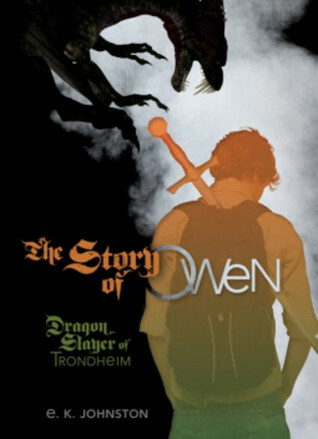 Johnston’s The Story of Owen: Dragon Slayer of Trondheim. Funny, warm, quirky, and fantastically fun, it’s about teenaged dragon-slayers in modern-day Canada, and I love it so much I want to push it at EVERYONE, shouting “Read it! You’ll love it! Just try it! Now, now, now!” I’ve raved about it on Twitter; I’ve raved about it at length on Facebook; I may well gift it to multiple people in my family this year. It’s a book that (to me, anyway) needs to be shared! What about you guys? What was the last book that turned you into a Book Missionary? Previous post ← Come to an awards ceremony! Ooh, I have to look that book up! The books that fill me with most missionary zeal are Megan Whalen Turner’s Queen’s Thief books. Any other enthusiasm seems mild in comparison, but I would say my most recent zeal was caused Emma Barry’s romances. Oh and I just read Bone Gap by Laura Ruby this week and have already recommended that to Twitter and friends on the phone. Brandy, I am so glad you turned into a Book Missionary for Emma Barry’s books, because that’s how I discovered them! I love the Queen’s Thief books, too, so I definitely have to look up Bone Gap! I work at a bookstore, so this is basically what I do all day, but there are a few books that I will buy and hand people. And Angelmaker by Nick Harkaway. I don’t know how to explain this book. It’s a little bit steampunk. There’s an octogenarian super spy. There is a clockmaker who is heir to one of London’s most beloved gangsters. There is a 1950’s-style super villain. There are clockwork bees. I love this book so much I devoted the top of my left arm to it. I have a giant tattoo inspired by Angelmaker. It’s just lovely. Oh, Sara, thank you so much for doing that with my books! And ooh, now I really have to try Angelmaker.